Darwin has earned a reputation for creating some of the strongest card effects in modern magic. 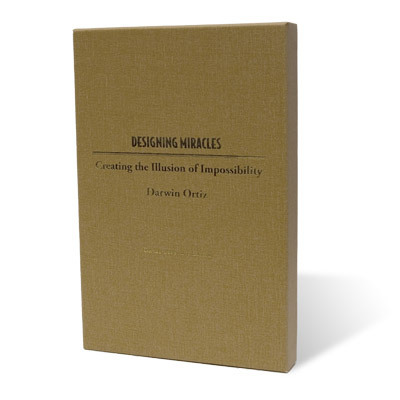 In Designing Miracles, he reveals for the first time the principles and techniques that he follows in doing so. These insights will help you choose stronger effects, create stronger effects, and strengthen those effects that you’ve already performing. If you’ve ever been puzzled by an audience’s reaction or lack of it, this book will dispel the mystery. It gives you a new set of tools for understanding how magic works, why it sometimes doesn’t, and how to make it work better. Never again will you be at a loss as to why an effect isn’t playing well. Never again will you be at a loss as to what to do about it. If your goal is to provide your audiences with an unforgettable experience of impossibility, you’ll find Designing Miracles filled with insights to help you do so. It will teach you how to use the audience’s own thinking patterns against them. It will show you how to turn puzzles into miracles. It will do something that few magic books can: change with way you think about magic. Darwin Ortiz is widely recognized as one of the worldâ€™s leading sleight-of-hand performers with playing cards. He is also the author of some of the most popular and important books on magic ever published, including the best-selling book, STRONG MAGIC. He also serves as an international consultant to the casino industry on the prevention and detection of cheating. His eleven DVDs and six books, including Darwin Ortiz on Card Cheating and Gambling Scams, are widely used as reference and training tools in casinos throughout the world, and he is called to testify as an expert witness in casino cheating cases. As an entertainer and expert consultant, Darwin has performed on every continent except Antarctica. Pages 200 – Hardcover – Collector’s Edition: Signed and Numbered out of 100, Slip-case. Availability: Hard To Get, Good Luck! What if you could harness the power of gravity? What if you could ignore it? This is Hover Card. You stand on the street. All eyes are on the deck. Silence and raw anticipation pour through the air. With all attention focused on the deck, one card begins to visibly RISE. The motion is slow; the force is under your complete command at all times. There are no strings. There are no wires. There is nothing but you, your audience, and a crisp deck. With only that, you have the power to perform. TEASER AVAILABLE SOON – CHECK BACK. Even without being told, from reading the description alone, you should just know, this is a Paul Harris effect. Ladybug is simple, stab your finger, bleed a bit, and then, with your otherworldly powers, bring the blood to life – specifically, you change it into a real live ladybug. Richard Sander’s worker’s solution to the Ring on Shoelace plot. It sounds like everything you have wanted in a ring flight: Angle proof, no reset, no duplicates or reels. Definitely a new effect. Devin Knight raises the bar again when a borrowed ring transposes with the ball bearing inside of a can of spray paint. The easiest way to get the ring out is to spray it out through the nozzle on an index card. The card is folded into quarters and visually inflates – the ink changes to the ring! You’re going to LOVE Prohibition! Singled out by the legendary Paul Harris for inclusion on his ‘True Astonishment’ DVD set, SMOKE RINGS is a truly incredible impromptu miracle! Effect: Any card is borrowed or freely chosen by a spectator and signed. With both hands unmistakably empty, two impromptu rings are torn from the card. Without any overt actions or suspicious cover, the two rings are magically linked together, one ring hanging from the other. Such is their linked condition that one ring must actually be torn in order to free the other – one ring is unmistakably displayed as being torn.To finish, the torn ring is completely restored and everything is handed out for examination. There is nothing to find. The rings may be kept by the spectator as a souvenir. Believe it! A signed egg and a signed quarter meet to create a new effect by NÃ©fesch. Check out the site here. GHOST VISION is a spine-tingling effect that allows you to use a borrowed portable electronics device to create a digital seance that can be saved as photo or movie. It’s easy to perform and works with most camera phones.